1 Melt margarine in large saucepot over medium heat and cook onion with garlic, stirring occasionally, until onion is tender, about 3 minutes. Stir in rice, Knorr® Chicken Bouillon Cube and water. Bring to a boil over high heat. Reduce heat to low and simmer covered 10 minutes. 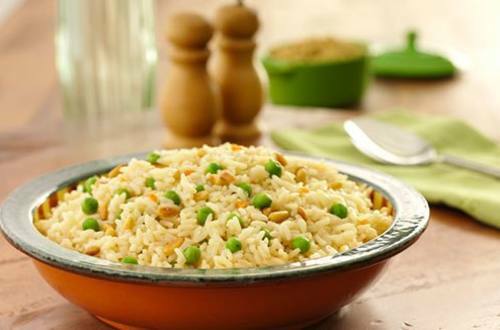 Stir in peas and cook until rice is tender, about 10 minutes. Stir in pine nuts and season, if desired, with black pepper.